A 70-year-old hermit who has spent her entire life in the Siberian wilderness has been airlifted to a hospital to treat a pain in her legs. Agafia Lykova is the last remaining member of a deeply religious family that fled civilisation in 1936 and did not know about the second world war until geologists stumbled upon them in 1978. After she contacted the “mainland” with an emergency satellite telephone to ask for medical help, the governor, Aman Tuleyev, ordered her evacuation from her homestead near the Abakan river to a hospital in Tashtagol, according to the Kemerovo region website. A member of the Old Believer sect that split off from the Russian Orthodox church 350 years ago, Lykova’s father, Karp, took his wife and two children into the taiga after a Soviet patrol shot his brother, eventually settling more than 150 miles (240km) from the nearest village. 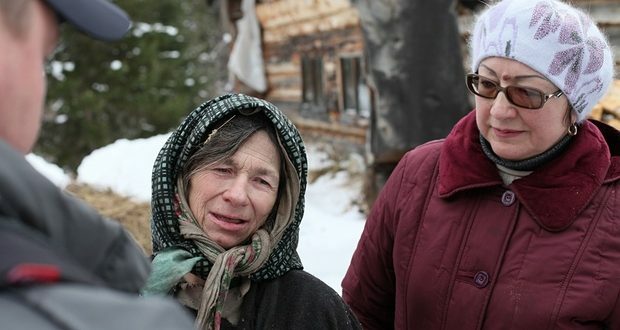 The family survived for decades on their remote homestead, where winter temperatures reach -40C, without guns, salt or metal implements. The youngest of four children, Agafia had not encountered any human beings outside her family, had read only the Bible and prayer books, and had never tasted bread or milk before she was 35. Outdated words and religious terms pepper her speech. She has lived alone since her father died in 1988, although bears and foxes sometimes disturb her looking for food. Last year, the British director Rebecca Marshall began work on a documentary about Lykova, called The Forest in Me.